Droogmakerij de Beemster (Beemster Polder) was constructed in 1612 as one of the first experiments in Holland in reclaiming agricultural grounds from the water. The new land was not only used for farming: a lot of rich people from the wealthy city of Amsterdam built their second home here. Their houses have now disappeared, as have most of the windmills. The area is split by roads in squares of 1800 meters. The roads, the canals, the grounds and the farming houses all are part of the ingenious 17th century masterplan. Therefore, Unesco described the landscape as a masterpiece of creative planning. So typical Dutch that it even is not remarkable anymore when you are living there. Flat, very flat, and neatly ordered. The best views of this and other polders in the area are from the air, when you prepare for landing at Schiphol Airport. My first visited was on a dreary Sunday, not the best of times. 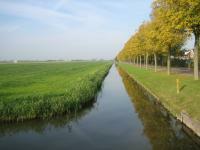 A good way to explore the Beemster polder is on a bicycle. But beware: the wind can be strong in these open fields! On my second visit I tried to find (and photograph) some of the 62 monuments that are included. The village of Middenbeemster is the core area for this: when you park your car near the church, a couple of the monuments are close enough to visit on foot. A little more out of the way are the windmill (under repair) and the Mennonite church. The roads are so narrow here that it's impossible to park. “When will we be there?”, asked my wife when we were driving in the middle of the WHS Beemster. A question, I quess, which kind of sums up the outstanding universal value of the site; if you don’t know about it you will have a hard time seeing and appreciating it. Because the Beemster just looks like any other “polder”, a green flat meadow, I couldn’t really blame her. 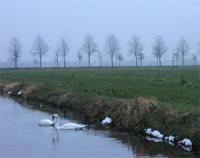 However, when it was created in the 17th century the Dutch made an effort to create the most ideal landscape ever made. It was the time of the Renaissance and old ideals about order, symmetry and harmony were pumped in the new land as to give it a feeling of harmony and proportion. Everything what you see nowadays is actually the result of quite some thinking. The new land was diveded into squares of app. 900 meters and by doing so they created a chessboardpattern in the landscape. At the edges of the squares either a road or a ditch was built so products from the land could be transported easily. The trees along the road are there so they could protect the traveller against the weatherconditions and to emphasize the straight lines in the landscape. The farms on the new land had a square core and a pyramid roof etc and etc. It was all about mathematics in the polder. After the work was finished people as far away as Florence (the Renaissance city par excellance) came to see what was made from scratch. When I explained this to my wife she couldn’t stop laughing. To her it still was the green flat meadow as just a few minutes before. All I could say was that she probably was so familiar with the surroundings that she wasn’t able to see the genius it contained. Best things in life are also the most simple I said but she could not be convinced. 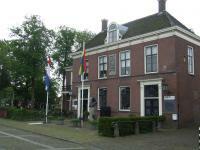 I visited this WHS on Queen's Day (30th April 2013). The Oranje colour was omnipresent but still I could enjoy a quiet and peaceful walk in rural North-Holland. As others have stated, there isn't much to see apart from the church, red brick houses, 2 museums and well the green flat polder! It is less rewarding than Schokland in my opinion but might deserve WH status if what they claim is true: namely that it served as a model/plan to build US cities such as NYC. Other than that, the only reason that might bring me here again is the scrumptious food served in the restaurant just opposite the Middenbeemster church! Like the other reviewers here, I'm not too enthusiastic about this site. The bus ride from Amsterdam Central Station (buses leave on the north side, near the ferry terminal) takes 45 minutes, and then it takes you another 20 or so minutes to see everything in the tiny village of Middenbeemster. I don't really understand how this place could be a WHS, except for the not very specific reason of being a typical Dutch landscape having to do with water management. On a positive note, the landscape there is rather idyllic, a world away from the urban jungle of the Randstad and with a surprising number of animals both tame (horses, cows, sheep,...) and wild (swans, herons and many other kinds of waterfowl). The info centre is reasonably well-stocked with maps and folders, and the helpful lady there could answer all and any questions. The major monument in the village is the large church, which I didn't go inside since it was a Sunday morning and there was a Mass going on. Generally, I doubt Beemster's WH value, but it was still a nice trip into a rural part of the Netherlands that most people miss. Several forts of the Stelling van Amsterdam are close by, but they are only practical to visit if you have a car or bike. I admired the distictive architecture of the remaining houses in Middenbeemster, which I reached by bus #100 from Amterdam Centraal station. I must admit that I was not really looking forward to this visit; it is by its very essence featureless, just flat and featureless. However I actually quite enjoyed the few hours I spent driving around and having a walk. 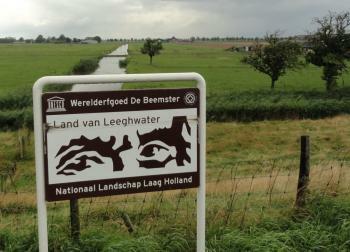 It was the one site where I could grasp the Dutch water management system that seems to dominate their inscriptions. There is no real monument or place where you can ‘see’ this site; you just have to lose yourself on the very straight roads overlooking the fields. One aspect that didn’t really occur to until I looked out at the landscape, but in Britain and most other places I have visited farms are all bounded by fences or hedge rows, but here it was drainage ditches that stopped the cows from wandering off, it is not really such an exciting point but I just found that quite interesting, and it gave the countryside quite a distinctive character. I visited the town of Middenbeemster, it looked a lot like a very well presented ‘small town America’ however I was corrected on this, small town America looks a lot like this! The rigid grid layout of the roads was exported to the new world; Beemster even has a claim to being the model that the street plan of New York is based on. 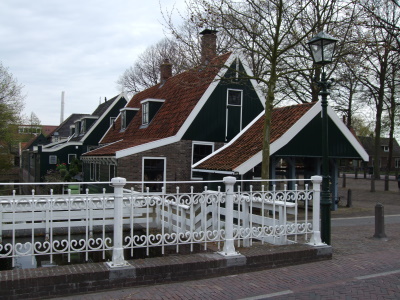 Middenbeemster was quite a nice place and had a few small museums, traditional farmhouses (picture) and a very friendly and helpful tourist information centre. There is a dike that runs around the edge of the polder and from here you can really appreciate the difference in the levels of the surrounding lands and the polder itself. Also along the southern parts of the dike are three of the forts from the ‘Defensive Lines of Amsterdam’ WHS, the one at Spijkerboor is normally open to visitors but was closed when we visited but we had a little walk around it, and held a celebration for seeing the lesser spotted UNESCO site in a UNESCO site. The Beemsterpolder might be on the Unesco list, but to me, and I guess to every Dutch person visiting it, it looks like any other polder: flat and green. This wasn't a very exiting visit, but when we drove up the small dike around it, it was pretty cool to see how high the land and water next to the Beemsterpolder is. More of historic value to the Netherlands than actually a place to visit, could be a way to characterise the Droogmakerij de Beemster Polder. Droogmakerij means “make dry” in Dutch and Beemster is the name of the oldest “polder”, an area that has been transformed from sea to land. As you all know, this is somewhat of a Dutch speciality and the Beemster polder happened to be the first really large undertaking back in the early 17th century. I visited the small village of Middelbeemster, located right in the middle of the polder, where a small museum and an information centre can be found. The story of how the Beemster polder was made is very interesting and a good example of Dutch business and craftsmanship. If you’re in the neighbourhood, head for Middelbeemster, go to the museum and then go for a relaxing lunch at the gourmet restaurant not far from centre point and the crossroads. 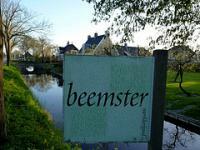 My Family comes from the Beemster and I have returned there on numerous vacation from the time I was 5. Having lived near the mountains in Southern California, I can attest to the fact that when you sit in the middle of the Beemster, it looks flat. I have been there for all four seasons. The Colors in the spring will knock your socks off. Some of the sunsets in the late fall and winter are unbelievable. The number one thing you can find in the Beemster (besides the cheese) is the people. They are some of the most friendly in the world. Lowest (below sea level): -3.8 m.
Exact locations inscribed twice (or more): Contains five forts and three sluices belonging to the Defense Line of Amsterdam. 184 Community Members have visited.